Kumpulan Fima, another stock with extremely low PE, high net cash, solid earnings from diversified businesses and riding on the wave of strong CPO prices. Earnings over the next few quarters will be boosted by strong CPO prices. The company's earnings are mainly generated from three main business segments, namely production and trading of security and confidential documents (Manufacturing), oil palm and pineapple plantation and bulking services. About 54% of earnings come from manufacturing division, followed by plantation (35%) while the remaining come from bulking services coupled with food (canned fish products) and trading (military aviation agencies and food products packaging). Earnings from manufacturing division has been on an increasing trend albeit at a slow pace of single digit percentage increase p.a. The bulk of the earnings growth will be coming from the plantation division in view of the favorable CPO prices coupled with its expanding planted areas. The company currently owns about 21,000ha of plantation land of which 7,600ha are planted with oil palm and pineapple (proportion unknown). For now, I've no idea how it could rake in PBT of more than RM30 million with just 7,600ha of planted area in FY2010. Other plantation companies would probably need about 14K-15K ha of planted area to have that kind of profit. Unfortunately, its palm oil production figures are not available in KLSE website. Having said all these, profit is still good. Its plantation PBT was at RM13 mil already for quarter ending June 2010 when CPO prices were still low at less than RM2,500/MT. With current CPO prices at more than RM3,000/MT coupled with higher production (2H probably 50% higher compared to 1H), earnings from this division are going to spike up. Valuation: 1HCY2010 net profit (Note that I'm using calendar year, not financial year) is already at RM30 mil. 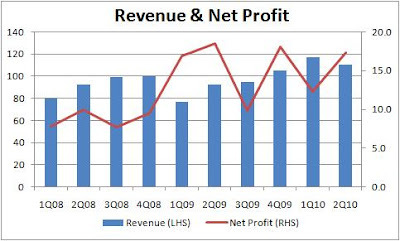 With high CPO prices and palm oil production, net profit for CY2010 could reach about RM70mil or 26.6 sen per share. 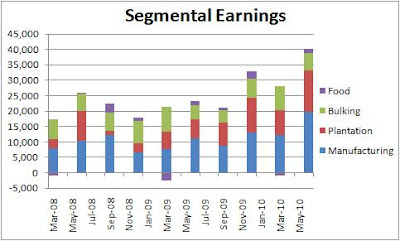 Thus, PE for 2010 earnings might be less than 5x!!! Dividend yield is reasonable at 4%, supported by strong cash position of RM102 million or 39 sen per share. 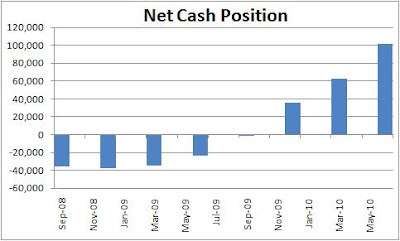 Its cash position kept on increasing unabated. This could easily pave way for further acquisitions and expansion of oil palm plantation or more generous dividend payout. Attaching a PE of 8x would put its share price to RM2.10. PS: They just entered into a conditional S&P agreement to acquire 80% of Victoria Square Plantation SB which in turn holds 65% stake in Amgreen Gain SB which has 5,000ha of land for oil palm cultivation. An estimated RM70mil will be used to develop oil palm plantation over the next 5 years on this 5K ha land.